Needing a reason to get off campus? Want to feel cozy? Craving a caffeine boost? There is no better way to cover all of these things then by traveling to one of the many coffee shops in downtown Fargo. While there are many coffee shops in the Fargo/Moorhead area, there are two specific ones that were selected for this review process: Babb’s Coffee House and the Red Raven Espresso Parlor. Maybe it’s the regally painted purple walls, the brick covered wall, soft wood floor, or the sophisticated chandelier hanging in the back part of the coffeehouse, but Babb’s Coffee House feels like sitting in a living room. The intimate seating of varying furniture pieces which offer different degrees of comfort provide an expansive space to enjoy. The natural light filtering in from Main Avenue is met with a neon red “Public Market Center” sign glowing behind the service counter. 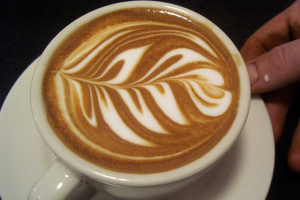 Baristas are friendly, soft jazz is soothing, and the artistic pieces decorating the walls are fresh. If seeking an outing at Babb’s Coffee, Melanie, a barista there, recommends ordering Babb’s most popular item, the “White Chocolate Mocha.” To access WiFi, a purchase must be made, but this certainly isn’t an obligation as customers can pick from the selection of warm and cold beverages, varying sandwiches, breakfast foods, and desserts. Babb’s Coffee House is sure to be one of Fargo’s finest coffee establishments and one that certainly should be checked out! For those looking for a more community-based coffee shop, look no further than the Red Raven Espresso Parlor off of Main Avenue in Fargo. Between the brick wall (a common theme in coffee shops it appears) that is adorned with photographs, the series of mismatched tables scattered without pattern around the room, the multi-colored tiled floor, or the favorite floral printed sofa in the back corner of the shop, the Red Raven’s charm will entice anyone into a pleasant coffee break from life’s chaos. Every part of the Red Raven radiates community whether it be from selecting a slightly worn book from the book-swap library rooms, the chalkboard calendar painted on the counter encouraging community development, the stage that sits unoccupied (for now) at the back of the shop, or the on-going list of events that are set to occur at the Red Raven, some of which include: a “Seed Swap,” live jazz, or the Red Raven Comedy Night. Upon going, remember to bring cash as cards are okay, but hurt small business coffee shops like this one. When ordering, keep in mind that unlike other coffee shops, the Red Raven grounds its coffee grounds fresh with each and every order. For those that prefer the sweeter side of coffee, the “Frappe Raven” is the drink of choice. Personally, the 12 oz. vanilla latte was a mighty fine drink for an afternoon study session. The Red Raven is a coffee shop that is an impeccable representation of good coffee, good service, and good community culture in downtown Fargo. Coffee shops in general are a great destination for a date, a friendly catch-up session, or a good studying base. Lucky for college students in the area: they are all over the place. As (hopefully) the winter is coming to a close and the Fargo-Moorhead area excitedly embraces spring, take a walk or bike ride downtown and enjoy some of Fargo’s coffee shop culture.